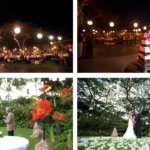 This wedding took place at the Four Seasons Resort Hualalai on the island of Hawaii. It was an intimate wedding at the famous Wedding Tree which is on a bluff overlooking the ocean and the 18th tee of the Famous Four Seasons Golf Course. Their wedding had a beautiful sunset and turtles on the beach. 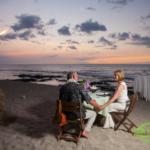 The evening ended with an intimate dinner on the beach for the couple and their family.